As glass has become more sophisticated, its popularity as a building material has grown. 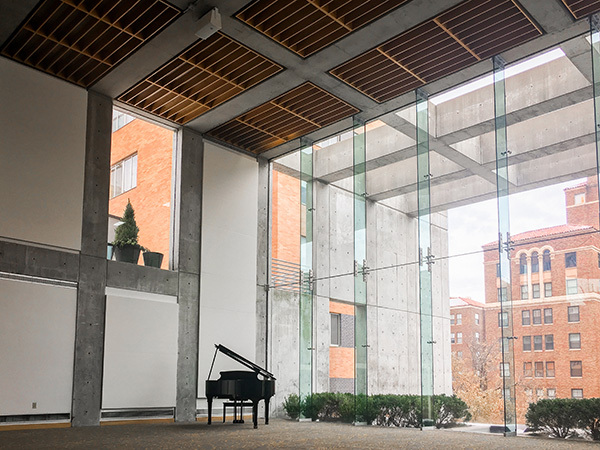 Curtain walls, demountable glass partitions, and skylights all offer ways to capitalize on natural light, views, and transparency. But glass has a few inherent acoustical challenges. Looking at what happens when sound encounters a window can demonstrate these acoustical challenges. The glass converts some sound into vibration energy, allows some sound to pass through and reflects the rest. A current project, this ballroom includes an attractive glass wall. We have all heard about opera singers who can break a glass by singing. This can actually happen! It happens because glass resonates at frequencies we can hear. The resonant frequency of the glass changes with its thickness. When energy at that frequency meets the glass, it causes the glass to vibrate like a drum head. Enough vibration can cause the glass to shatter! Sound is best blocked by limp, massive materials, and air-space (or even better, gaps devoid of air – i.e. a vacuum). Glass is rigid, and its massiveness is limited by transparency requirements that keep it thin. Glass transmits a lot of sound energy at its resonant frequency and at low frequencies. Laminated glass and insulated glazing units both reduce sound transmission through glass by reducing resonance and adding air-space. However, a properly constructed stud or masonry wall will almost always outperform glazing. Glass only “absorbs” sound near its resonant frequency. In this case, the glass changes the sound energy into vibration energy, instead of reflecting it back into the room, as it does with most other frequencies. Some perforated plastic film and fabric products mounted a few inches in front of the glass can help to absorb sound. However, until someone invents transparent fiberglass, glass will never be among the more efficient sound-absorbing materials. An acoustical consultant on your design team can recommend glazing packages/construction. A consultant’s analysis and advice can help balance the benefits and drawbacks of including glass. Knowing the potential acoustical impact of your design choices allows architects and owners to make well-informed decisions. This results in a space that balances the aesthetic and acoustical goals of the project. If you have any questions or concerns about a project or existing space, we’re happy to offer our advice. This post was authored by AVANT ACOUSTICS Senior Consultant, Emily Jaumard. Nice little article. I’ve never seen the perforated glass film…sounds interesting but also potentially maintenance intensive….. Be sure to say hello to Bob, John, Ed, Jill and the gang, looking forward to working with the team in the future. I was the building committee Chairman for Calvary Church in Charlotte, NC and selected you to do our sound work. It was Coffeen Anderson and Frickie at that time about 30 years ago. Do you still have those plans? We may be doing some redecorating but we do not want to change the quality of our sound. We have one of the 3 largest pipe organs in the world and our sanctuary seats 6,200.